Vienna is an ornate and stately city where the strains of the great classical composers who lived and worked here seem to seep from the stones along with old world charm. This is why a holiday in Vienna is enough to inspire anyone to hum the 'Blue Danube' and waltz around the sights before they head for the woods to end the day in the cosy atmosphere of a traditional wine tavern. Speaking of taverns, Vienna boasts a booming bar and restaurant scene to complement its many historic and cultural offerings. The city is also home to some wonderful markets which provide great shopping opportunities. The whole family can find fun and fascination on a Vienna holiday, with plenty of fun activities and diversions from the performing horses of the Spanish Riding School and the thrills of the Prater amusement park to the opulence of the Schonnbrun Palace. The best time to travel to Vienna is in spring (April and May) and autumn (September and October), when the weather is beautiful and the peak tourist season is beginning and ending. 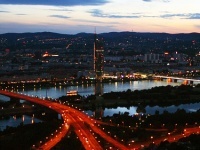 Summer, between June and August, is the most popular tourist season and sees hordes of holidaymakers descend on Vienna. Read more on Vienna's Climate and Weather. -Enjoy lovely views of the city from the Giant Wheel in the Prater. -Marvel at the world-famous art collection of The Albertina. -See the Gothic masterpiece that is St Stephen's Cathedral. -Watch the prancing Lipizzaner horses at the Spanish Riding School. -Visit the beautiful Belvedere and its rewarding museums. -Get to grips with the world of Sigmund Freud at Vienna's Freud Museum. -Explore the world of the Hapsburgs at the Hofburg Palace and the Schonbrunn Palace. -Take a tour or catch a show at the Vienna State Opera. Vienna is situated in northeastern Austria and even the Austrian Alps, in the southwest, are within easy reach of the capital. The popular city of Salzburg is less than three hours away from Vienna by car, and Innsbruck, the gateway to the Alps, is four and a half hours away by car. Austria's main air travel hub, Vienna International Airport is located 11 miles (18km) southeast of Vienna. Trains also wend their way to Vienna from a number of European cities. Get more information on Airports in Vienna. -The snow globe was invented, by accident, in Vienna, and these whimsical globes make popular souvenirs. -Vienna contains good vineyards within its city limits, producing glorious wine. -More than 200 balls take place in Vienna every year. It is difficult not to be moved to hum a Brahms lullaby or a Strauss waltz as you explore the sights of Austria's beautiful Baroque capital, Vienna, which for centuries was the centre of the splendid Hapsburg Empire. The city remains infused with the grand imperial spirit in the form of magnificent palaces and grand mansions peppering the Innerestadt. The city's cultural heritage is mainly musical, the great composers like Strauss, Brahms, Beethoven, Schubert, Haydn, and Mozart all having lived and performed here. Today, the Vienna Philharmonic Orchestra and the State Opera House help keep alive the city's tradition by offering more classical music performances a year than any other city in the world. Vienna is a city of music, but it is also synonymous with gourmet fare, cream cakes, superb coffee, the angelic strains of the Vienna Boys' Choir, and the proud prancing of the Lippizaner stallions at the world-famous Spanish Riding School. Vienna started out as a Celtic settlement on the banks of the Danube and became one of Rome's most important central European bases. Its central location on the strategic river contributed to the city becoming the stronghold of a mighty empire, reaching its peak during the tumultuous reign of the dazzling Hapsburg dynasty. At the end of the 19th century, the golden age of empire began to decline as Vienna's coffee houses filled with radical intellectuals like Freud, Klimt, and Mahler. The Second World War Nazi occupation left scars, but Vienna survived it all to remain a captivating capital that blends Italian romanticism with a Germanic orderliness. Most of the city's tourist attractions are within the largely pedestrianised inner city area, which was once enclosed by the city walls. The walls have been replaced with the Ringstrasse, a wide ring road. Further out in the suburbs is the thrilling Prater amusement park with its massive Ferris wheel, and the opulent Schonbrunn summer palace. Visitors also should not miss a trip to the Vienna Woods, peppered with heurigen (wine taverns).